Why it makes more sense? The Hytec AquaPlan is an all-inclusive water management solution for property managers, commercial building owners and condo owners. This cost-effective rental program includes installation and ongoing maintenance of the Hytec System, Hytec Treatment products and customer service. For most condo owners, the Hytec AquaPlan begins at as low as $4.90 a month/condo unit. Compare that to the cost of re-plumbing––which can amount to $15,000 per condo unit––and the cost of Hytec Water systems seems eminently reasonable. You do not purchase the Hytec System because it requires continuous maintenance and service, which we provide over the life of your Hytec AquaPlan, updating your system every three years. The Hytec System takes three days to install and the remedial effects begin as soon as the system is in place and the Hytec Treatment Products are introduced to your plumbing. As part of the AquaPlan, Hytec partners with local plumbing companies to ensure that we have trucks on the road 24-hours a day, guaranteeing that you receive the very best in customer service. The Hytec System features six core components, each one combining state of the art technology with premium-grade original equipment manufacturing. Its unique design allows Hytec to manage your property’s water with precision, efficiency and the utmost safety. All Hytec equipment comes with a full-term warranty and is guaranteed for the life of your AquaPlan. As a part of our commitment to service, ongoing system maintenance, including routine site visits, testing and performance reports, are provided free of charge. The myHYTEC online monitoring package delivers real-time water quality results, 24/7. Clients can remotely view supply levels, system function, and water quality at all times. This removes any guesswork from your Hytec system management. Our system components use ultrasonic sound technology to measure the rate of water flowing through your building. There are no moving parts, meaning that the equipment is extremely reliable and capable of enduring even the largest, most complex buildings. The myHytec remote monitoring package allows for real-time survey of water quality and system levels. With 24/7 access to online water quality results, Hytec clients can enjoy perfect peace of mind, wherever in the world they may be. The Hytec System uses advanced security measures to help prevent unauthorized adjustments. Safeguards like tamper-proof locking lids, double walled product tanks and digital lockout codes, ensure that your system is operating safely and securely. 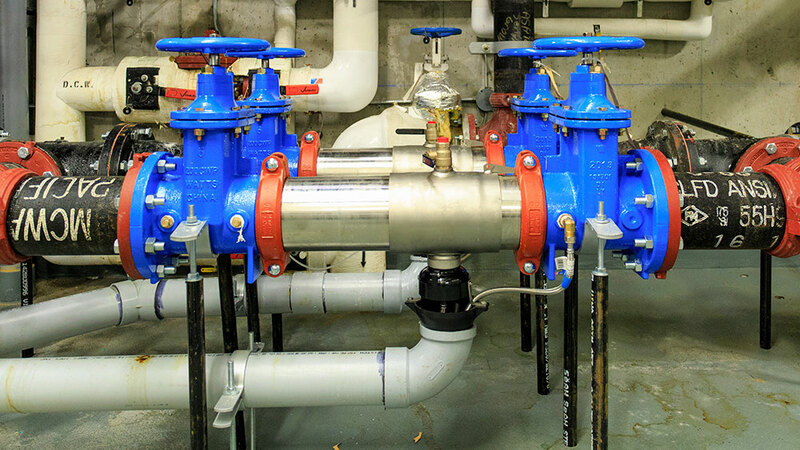 The Hytec Backflow RPB Valve prevents water from re-entering the city’s water supply once it has been treated. As a standard safety precaution, all Hytec systems require a Backflow RPB Valve in accordance with the City’s municipal regulations. 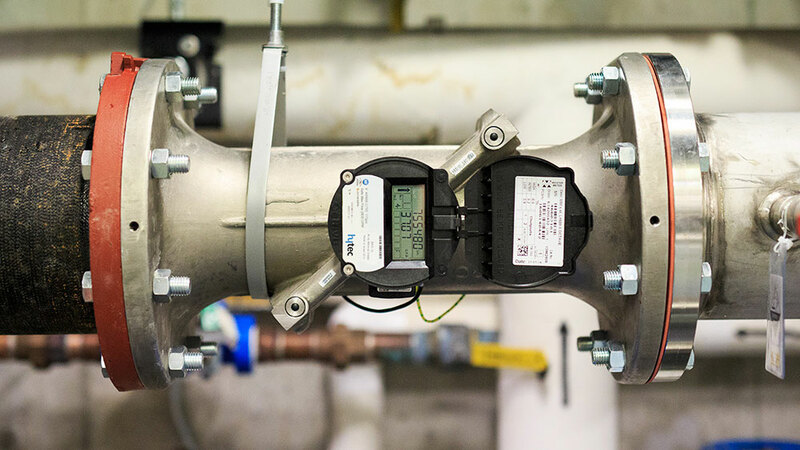 The Hytec Ultrasonic Meter uses dual beam ultrasonic sound technology to measure and communicate the rate of water flowing throughout your building with extreme accuracy and precision. The use of ultrasonic technology means that there are no moving parts, allowing for long lasting and extremely reliable performance. The meter’s digital interface is highly secure, using password protected locks that make it extremely secure, ensuring that access is provided only to those who are authorized. Hytec double walled product tanks are designed to safely store Hytec treatment products. The double wall construction prevents treatment product leakage. The inner tank dome overlaps the outer tank sidewall, ensuring that nothing can get into the tank, or leak out. As an added safety measure, Hytec product tanks are equipped with tamper-proof locking lids to ensure that unauthorized alterations cannot be made. Hytec’s Dual Dosing Pumps use the latest in Digital Dosing technology. 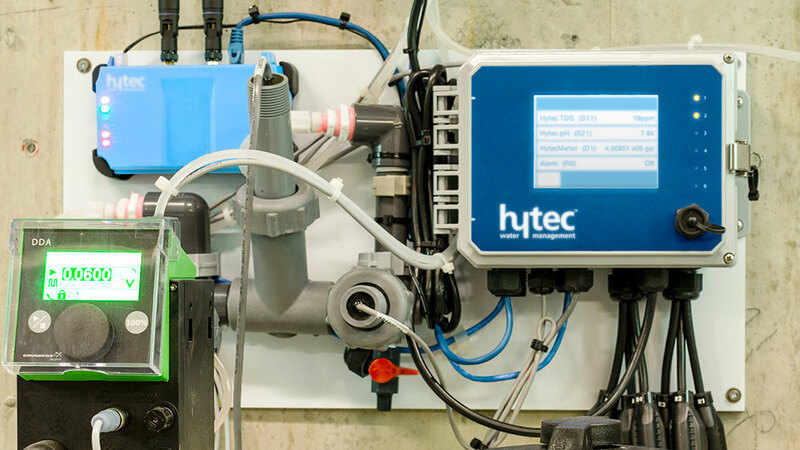 The pumps are in constant communication with the Hytec ultrasonic metering system: reading, controlling and diagnosing exactly how much treatment product needs to be added to your water. The digital technology is extremely accurate in its delivery, which ensures optimal treatment levels, at all times. Hytec pumps are equipped with lockout codes for increased security and their digital interface provides real time monitoring so that our support team can remotely follow and adjust your system’s performance at any given time. The Hytec Stainless Steel Injection Manifold is critical for the introduction of Hytec treatment products into your building’s water system. 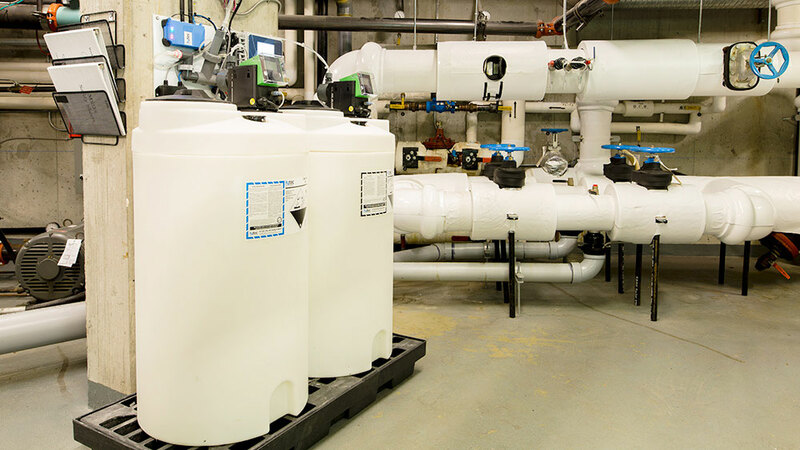 Its unique design allows for our products to be injected and mixed simultaneously, before circulating your building’s plumbing. All Hytec manifolds are made from food-grade stainless steel, produced in Vancouver and approved by the City. Your copper plumbing has no immune system to defend itself against untreated soft water, which leads to corrosion; Hytec treatment products provide the immune system that your copper plumbing lacks. All Hytec treatment products are locally made, government certified and recognized by Health Canada. In 1997, a study by the Environmental Protection Agency in partnership with the University of British Columbia, reported water treatment as a highly effective solution to controlling pinhole leaks caused by soft water corrosion. Hytec treatment products are made from naturally occuring minerals, which have been subject to rigorous testing by Health Canada. These minerals are not only healthy to ingest, but mitigate the risk of consuming harmful metals which have dissolved from your plumbing’s walls. Hytec invests in and supports our local community, which is why all of our water treatment products are produced in local research labs, by experts in water management. As a vancouver-based company, we believe it’s important to support local businesses and aim to do so whenever possible. All Hytec treatment products are certified for safe use in potable water under NSF Standard 60, which addresses the health effects implications of treatment products and related impurities. Hytec AquaSoft SW is used to control soft water corrosion in high rise condominiums and commercial properties, and represents 90% of the Hytec solution to pinhole leaks. By continuously placing a microscopic protective coating on the inside of your copper plumbing, AquaSoft SW helps repair existing pinhole leaks and prevents new ones from forming. The microscopic coating—similar in thickness to a sheet of paper—is made of natural minerals, known in chemistry as zinc orthophosphates. This treatment product is not generic or common, it has been formulated over 15 years of experience and is proprietary to Hytec Water. When introduced at the correct level of treatment to provide its protective coating, AquaSoft SW lowers the pH of City water. 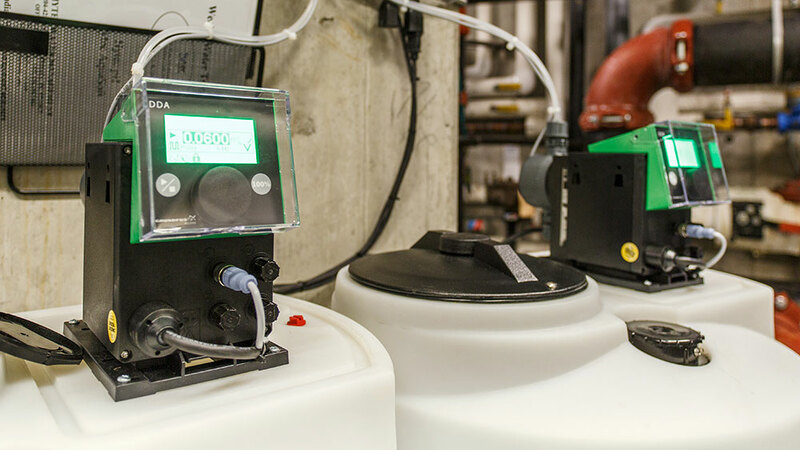 The purpose of Hytec pH Control is to act as a buffering agent to this change in pH, balancing and correcting your water’s pH level to a positive alkaline level of 8.0. This pH level allows AquaSoft SW to form its protective coating quickly and stops the blue-green staining typically found in showers and bath tubs. Hytec AquaSoft HW is used to address the problems of hard water scaling in high rise condominiums and commercial properties. Our unique blend of food-grade polyphosphate minerals target the hardened scale deposits, first releasing them from your plumbing walls and then, crucially, sequestering the minerals, preventing them from reforming. Once old scale and bio-film deposits have successfully been removed, we introduce a microscopic protective coating to protect the inner surface of your plumbing from pinhole leaks and excessive wear. This treatment will significantly extend the life of your plumbing with minimal problems. Chlorination has long been used to disinfect water lines, but it has a number of practical limitations for farmers today. Hytec has mastered a better alternative: chlorine dioxide. In combination with a specialized Hytec water management system, we use chlorine dioxide to prevent water-born bacteria, viruses, fungi and ecoli; to eliminate bio-film in your water lines; and to boost the overall performance of your farm water. Healthier water leads to increased weight gain, improved plant growth, a reduction in mortality and cleaner, longer lasting water lines. 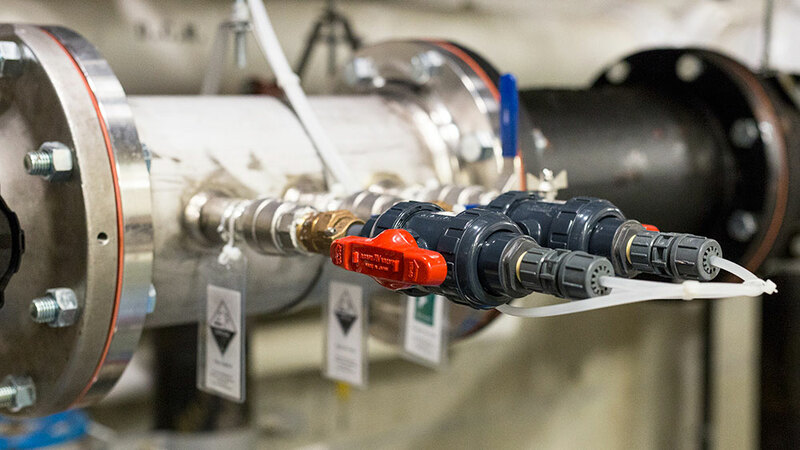 Once the Hytec system is installed, we take care of it for you, ensuring that your treatment levels are optimum, metering and digital pumps are functioning perfectly, and plumbing is working smoothly. This also means that building managers aren’t charged with learning to manage another system. All Hytec systems come with full-term warranties on equipment over the life or your Hytec AquaPlan. We’ve sourced long lasting and reliable system components, but if anything needs to be replaced or upgraded we’ll happily take care of it, free of charge. As a Better Business Bureau A+ member, we put our customers first. Hytec has service representatives available to field your calls and maintain your building’s system 24 hours a day, 7 days a week.